Curated by Song Tao*, this exhibition at Domus Tiandi (Beijing) combined antique Chinese rugs with contemporary Italian furniture (B&B Italia, Minotti, Poliform, Maxalto ...) and contemporary Chinese artworks. The results are stunning settings with a unique style and character, stylish yet highly intimate spaces. *Song Tao - A contemporary artist and a leading figure in the design industry of China. He studied Graphic Design and Drawing at the National University of Art and Design before completing a master's degree of Plastic Arts in Paris 1 Pantheon-Sorbonne University. In 1994, he returned to China to found the TAO Gallery, which has held numerous exhibitions for China's leading contemporary artists. 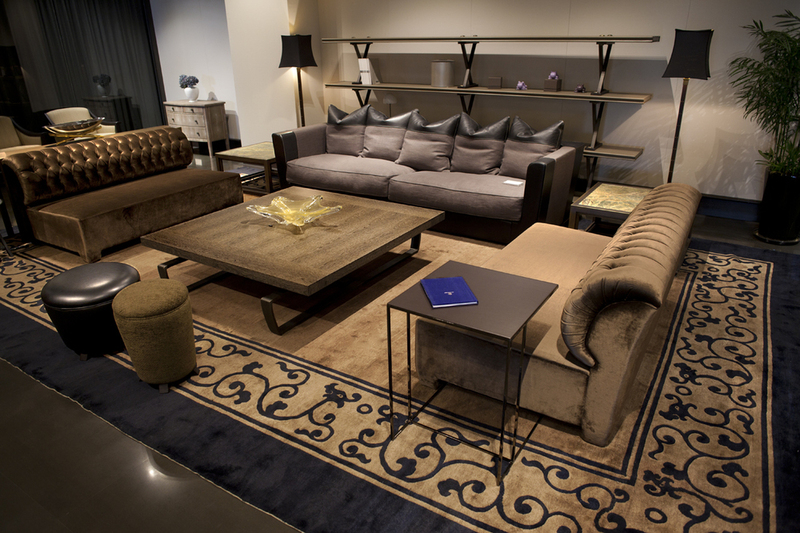 The Song Tao Design Studio followed, offering services in Interior Design, Furniture Design and Exhibition Design. He has also founded an exclusive brand agency for China's top artists and designers and the art institution SAY FINE ART in the famous 798 Art Zone in Beijing. In 2012 he played a key role in the establishment of the Beijing Poly Auction House, which held what was probably the first design auction in China.